Recon, for 22 years has been a leader in the Electronics Assembly Equipment sales & service business. Our dedicated staff has earned business from companies around the globe. Recon understands the time proven concept the customer is the final arbiter in the marketplace. In 2009 Recon moved to a larger 50,000 sq ft facility to better serve our customers’ needs. We have expanded operations to office & warehouse facilities outside Rome, Italy, and added two new sales representatives in Mexico. Our customer base runs the gambit from fortune 500 companies, and OEM’s, to smaller contract manufacturers. 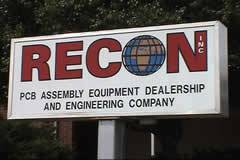 Recon has purchased and sold from companies such as IBM, Solectron, Flextronics, Celestica, Continental, GE divisions, and many more of these large OEM and contract manufacturers. Our devotion to the customer is the same whether a large corporate entity or a small start up enterprise. Recon focuses on key types and manufacturers lines of SMT assembly equipment in which we can support technically both prior to sale and after. Speedline MPM & DEK screen printers, Electrovert & Vitronics wave solders and reflow ovens, PVA, SCS conformal coating , Nicolet X-ray , Cencorp & JOT / Ozo routers, and a full offering of all types of board handling equipment by JOT – Nutek – Universal board flo, ATI, PCT, and others are our primary sale items. Our company offers custom solutions to help our customers achieve their process requirement needs. Process analysis, equipment, sales, installations, service, training, and preventive maintenance contracts have been our key areas of business – and have delighted our customer base for over a decade. If you have not used Recon as your vendor of choice I encourage you to call a Recon salesmen today. To our current customers: I thank you for your business ,devotion, and trust in our company.